The work of Pak Sheung Chuen is based on the artist’s belief that through his artworks he can bring to the fore the interwoven nature of reality and the imaginary. His works often reflect upon contemporary Hong Kong through personal observations and conceptual engagement with everyday life in the city and on the conflict between an ideal world and reality, which he tries to address with poetic solutions that strive to merge both worlds. After Hong Kong’s Occupy Central, also known as the Umbrella Movement, “the largest, most civilized civil-disobedience movement the city had ever seen”(1), which took over the downtown streets from September 28 to December 15, 2014, ended without achieving its goal of universal suffrage and greater democracy, Pak Sheung Chuen, like many other, felt disillusioned, and was for several months devoided of enthusiasm to work. Furthermore, he had started to question the impact and relevance of art for society during the Umbrella Movement. Pak Sheung Chuen perceives himself more as an observer than an activist, a stance toward his artistic practice he wanted to stay true to. He found it difficult to see how his working method could be meaningful in Hong Kong’s situation of political impasse and trauma. The exhibition includes works from the Nightmare Wallpapers series, a serie that marks a turning point in that it allowed the artist to enter “an aesthetic pilgrimage of self healing after the failure of the Umbrella Movement”. The abstract, decorative wallpaper design is actually a fragment of a drawing repeated as a pattern. These drawings were made during court trials, as the artist became used to attend to specific cases about political activists who were being prosecuted by the government. During those trials, the artist let his pen travel rapidly across his notebook without conscious control. Reminiscent of surrealist drawings of the early twentieth century, these psychologically and symbolically suggestive images provide a lot of room for interpretation within the viewer’s imagination. Pak Sheung Chuen scans his notebook sketches and enlarges them on his computer screen. Through this method he can study each little detail of his subconscious depictions, analyze his own emotions, and enter into a process of psychological healing. “I would read them – the images – and allow myself to be immersed into a meditative state of mind… Month after month, my inner chaos gradually shifted, and I was ultimately able to return to the complicated world outside”. By transferring his personal automatic drawings made during the hours spent in the courtroom to the mundane medium of interior decoration, he creates a work that poignantly addresses the relationship between state power (the court) and the individual (the artist) in a situation where freedom of expression is under pressure. Another distinct series derived from the automatic drawings is entitled Seals. 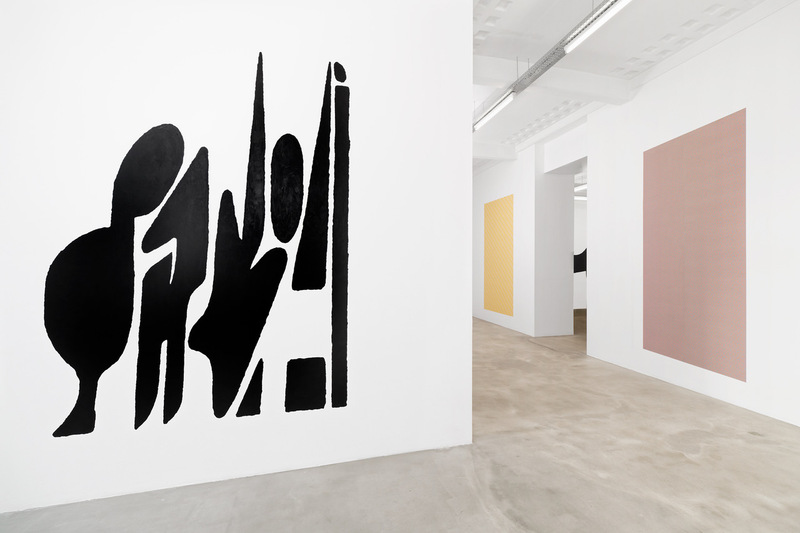 They are enlarged versions of his small notebook scribbles, painted directly onto the wall, which appear like black-and-white stencil graffiti. Unlike the drawings, which are occasionally obfuscated by the Op Art aesthetics of the repetitive wallpaper patterns, the Seals keep easily recognizable the images from the original drawings. Both graffiti and Seals are mark-making media, but they have very different agendas. In connection with court cases, seals are easily linked to law-enforcing documents stamped by government authorities, while Pak Sheung Chuen’s highly personal symbols, in stencil style, undermine any bureaucratic code system. Instead, their graffiti-like appearance lends them a touch of dissent; as imaginary signs they form a subtle revolt of ambiguity. Freedom of expression is, in fact, a major question that lies behind the works of Pak Sheun Chuen. It is not that the artist does not believe in the legal system, or that he thinks there is no justice at all; he tries to capture a changing atmosphere he detects within society that is often related to how the law is being made in Hong Kong. Indirectly, he addresses the fear of Hong Kong residents that Beijing has been intensifying efforts to erode liberties still enjoyed by the former British colony since it was returned to China in 1997.